Second Sunrise. (c) 2013 Wizards of the Coast. Now is the time to sell off all of your Modern cards. Why, you may ask? Two reasons: the Modern PTQ season is near its end, and because Modern Masters will be printed soon. 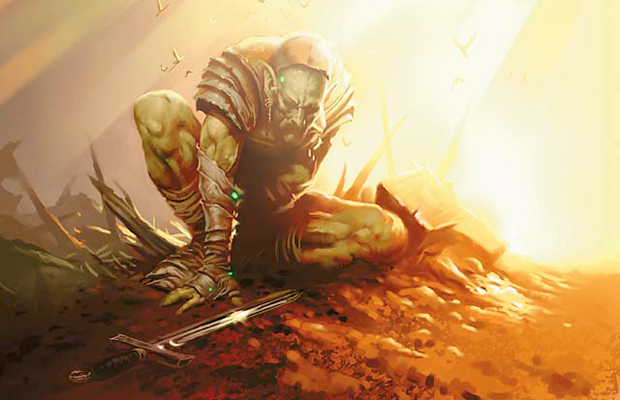 Most people are aware of the ebb and flow of Standard card prices, rising as States and the Standard PTQ season approaches, and falling as the season finishes. This ebb and flow of prices holds doubly true for Modern, as there are a lot fewer tournaments outside of the PTQs to affect their prices. Virtually every card that has seen play in Modern has gone up in price since the end of summer, many by a significant amount. My point is that there were very few poor investments when buying Modern cards before the PTQ season started. You could pretty much choose whichever Modern playable cards you wanted to buy, and made a profit on them. The other reason to sell off your Modern cards now, besides the fact that the PTQ season is nearing its end, is because Modern Masters is soon going to see print. Now, I acknowledge that long term Modern Masters will overall raise the price on Modern cards, as it piques interest in the format. However, some high priced Modern cards will be reprinted in that set, which will increase card availability, decreasing the price on those cards in the short term. Conversely, any cards that aren’t reprinted in that set should see their price remain steady or eventually go up. However, I don’t really feel like playing roulette on guessing which cards will be reprinted, and which ones won’t. Instead, I’ll just trade or sell all of my Modern cards now so I don’t risk them dropping in value if they’re reprinted. And as for the Modern cards I want that aren’t reprinted in Modern Masters, I’ll just trade or buy them back for the same price that I got rid of them (remember, Modern Masters is being released during the slow season for Modern, so there won’t be an immediate frenzied demand for any Modern cards). The net result will be your breaking even on the Modern cards that aren’t reprinted, and saving yourself from losing money on the cards that were reprinted and dropped in price. Now, with all this being said, in the long term I expect Modern card prices to stay firm or rise yet more, even the ones reprinted in Modern Masters. This is because new players are discovering this game every day, which keeps increasing demand for cards they don’t have. A year from now, I’m confident Modern card prices will be similar to what they are now, or even higher. However, short term, as Modern Masters is released and the Modern PTQ season ends, the reprinted cards will dip in price. Don’t agree completely on ‘sell all your modern cards’. It’s end of Modern season, but any card that won’t be reprinted in Modern Masters probably will keep it’s price or it’s gonna rise even. I’d recommend rather selling everything until Zendikar now and buying them again a month before MM is out.